Over the last twelve months, the stock of Canadian folk/roots artist Ruth Moody has grown considerably in the UK. During her most recent tour at the start of last year, we were just being introduced to her debut solo release THE GARDEN even though it had been available in the US and Canada for a while. However for its follow up there is no such delay and the launch of THESE WILDER THINGS has almost been synchronised across the pond. On the back of this high quality sophomore release, it appears that a Wailin Jennys’ reunion may be continued to put on hold as Ruth goes from strength to strength with her song writing, music making and high calibre of collaboration. Listening to this 10 track – 47 minute production is an enthralling experience as Ruth continues to successfully find a sound to suit her enchanting vocals and heart drenched lyrical outpourings. This is reflected in piano led ballads, more buoyant acoustic numbers and a brief excursion into the world of electric to support some of the more vibrant offerings. The ultimate compliment you can give is to acknowledge her extraordinary ability to extract every sinew of emotion from a multitude of instrumental sounds. Ruth’s successful stint as part of the 2012 Transatlantic Sessions cast has led to at least four collaborations on this album. Jerry Douglas, legendary Dobro virtuoso and Sessions co-founder, lends a hand to the excellent ‘One Light Shining’ thus giving it a very roots and bluegrass feel. Meanwhile the celtic influence of the Sessions has led to Ruth enlisting the talents of Scottish pair, John McCusker and Mike McGoldrick to provide some musical expertise via fiddle and low whistle to ‘Life is Long’. The fourth Sessions link is the guest backing vocals by Crooked Still’s Aoife O’Donovan who effectively replaced Ruth in this year’s line up. The eminence of Ruth’s collaborators moves up a notch with the guest guitar and vocals by Mark Knopfler on the excellent ‘Pockets’, a captivating tale of emotional intensity topped with a magical duet chorus. As part of her couple of upcoming UK visits, she is opening for Mark during his Royal Albert Hall stint. Although not in collaboration, Ruth does experiment on one track with a total re-working of Springsteen’s ‘Dancing in the Dark’. It took quite a few listens to determine whether the fiddle and mandolin treatment to this rock classic worked but ultimately this folk/roots style version convinced me of its merit. 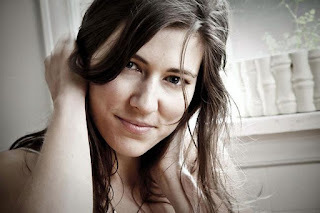 Apart from her classically trained beautiful vocals and acoustic string playing skills via guitar, banjo and ukulele, Ruth is also an adept pianist which is expertly evidenced on the haunting title track ‘These Wilder Things’ and the fabulous heartbreak ballad ‘Make a Change’. This take on facing up to a heartbreak decision is representative of the deep lyrical content that accompanies all nine self penned songs but not all are entirely sad downbeat numbers. Album closer ‘Nothing without Love’ with its banjo sound contains a memorable chorus emphasising the importance of love. While at the other end of the record, ‘Trouble and Woe’ leads off in gospel style with fiddle and banjo gracing a song which you could envisage having a live sing along presence. ‘Tree of Skies’ is another song that has the potential to come across better live than on record which just leaves the stand out song on the album, ‘The One and Only’. While a majority of Ruth’s songs do require a degree of patience to absorb their pure worth, this tempo changing radio friendly number, questioning the frustrations of eternal love, does take more of a bow to Americana than the contemporary folk ambience which generally describes her sound. The harmonies provided by current ‘Jennys’ Nicky Mehta and Heather Masse and the fuller electric sound are the contributing factors to this switch which does showcase Ruth’s diverse talents. 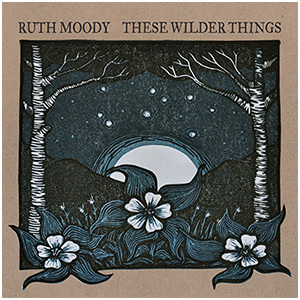 There is no doubt that THESE WILDER THINGS is a worthy follow up to The GARDEN, and there will be numerous opportunities to catch Ruth Moody and her band in the UK in the run up to her Maverick Festival appearance in July. By investing a little listening time, the rewards of experiencing this blossoming artist are unlimited, so immersing yourself into her music is highly recommended.